One way to transfer a selection of imagery from one layer or document to another is by using the Clipboard commands on the Edit menu. You choose the Cut, Copy, or Copy Merged command first to put the current selection into a temporary storage area in memory, called the Clipboard. Then you choose a paste command, such as Paste or Paste in Place, to paste the Clipboard contents as a new layer in the same document or in another document. If there is an active selection in the target document, another option is to use the Paste Into or Paste Outside command to paste the Clipboard contents inside or outside of the selection. The left image shows pixels Cut from the Background. The right image shows pixels Cut from a Layer. If you cut (remove) a selection from the Background via the Cut command, the exposed area fills automatically with the current Background color. If you cut a selection from a layer, the area left behind is replaced with transparent pixels (the same results that you get when you move pixels on a layer). The same Clipboard contents can be pasted as many times as needed. Only one selection can be stored on the Clipboard at a time, however, and it is replaced by new contents each time you use the Cut, Copy, or Copy Merged command. If Export Clipboard is checked in Edit/Photoshop > Preferences > General, the Clipboard contents will stay in temporary system memory when you exit/quit Photoshop – but only until you shut down your computer. When you use a paste command, the contents of the Clipboard appear automatically on a new layer. 1. Click a layer in the source document, then create a selection. We created a selection, then pressed Ctrl-C/Cmd-C to copy its contents. Edit > Copy (Ctrl-C/Cmd-C) to copy pixels from the current layer within the selection area. 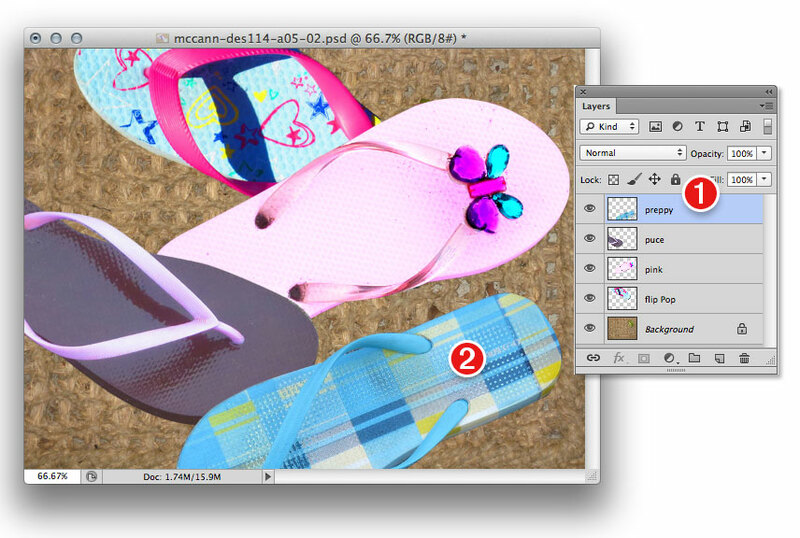 Edit > Copy Merged (Ctrl-Shift-C/Cmd-Shift-C) to copy all pixels from all visible layers within the selection area. Edit > Cut (Ctrl-X/Cmd-X) to cut the selection out of the current layer. 3. Click in the same document or in another document. To have the Clipboard contents land in the center of the document window (or if the dimensions of the copied content are larger than those of the target document, to the top and left edges of the canvas area), choose Edit > Paste (Ctrl-V/Cmd-V). To have the Clipboard contents land in the same x/y location as in the source layer or document, choose Edit > Paste Special > Paste in Place (Ctrl-Shift-V/Cmd-Shift-V). 5. If the source file has a different color profile than the target file, the Paste Profile Mismatch alert dialog will appear. We recommend that you click Convert (Preserve Color Appearance) to preserve the appearance of colors in the source image, then click OK.
6. The pasted pixels will appear on a new layer. You can re-stack the layer, and you can reposition it in the image with the Move tool. 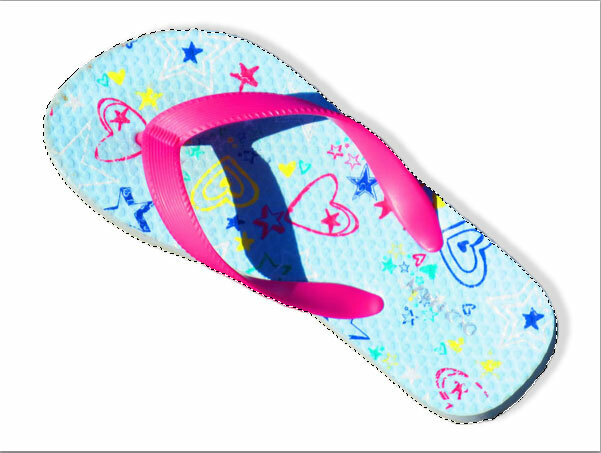 they arrived on a new layer, which was immediately named. When you paste or drag and drop a selection between documents, the copied imagery adopts the resolution of the target document. 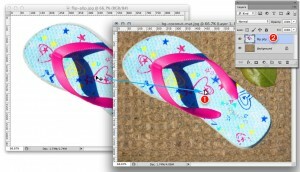 If the resolution of the target file is higher than that of the source one, the copy will look smaller than imagery on other layers; if the resolution of the target file is lower than that of the source document, the copy will look larger. If you want to prevent a size discrepancy when copying imagery between files, before creating the copy, change the resolution of a copy of the source file via Image > Image Size to match that of the target document (resharpen the image, too). To compare the relative sizes of the source and target documents, use the Window > Arrange sub-menu to arrange them side by side, and choose the same zoom level for both. To move hidden pixels into view, click the layer, then hold down V (Move tool) and drag in the image. To select all the nontransparent pixels on a layer, including any pixels outside the live canvas area (and pixels that may be hidden by a layer mask), Ctrl-click/Cmd-click the layer thumbnail on the Layers panel. Select > All, in comparison, selects only the rectangular boundary of the canvas area. 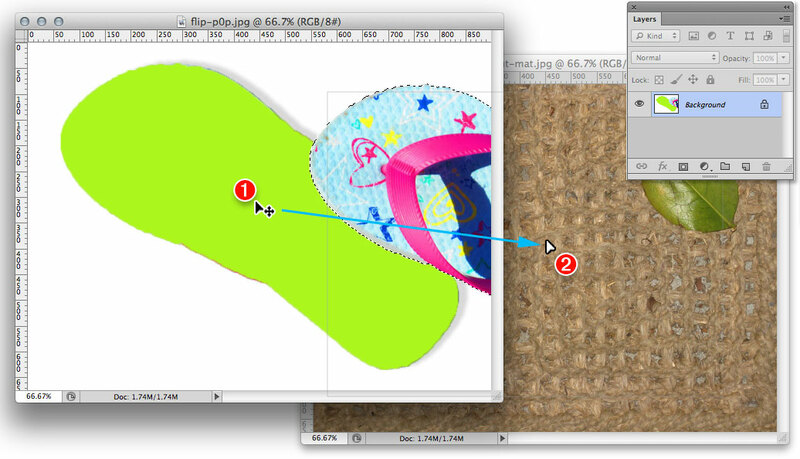 To enlarge the canvas area to include all hidden pixels on all layers, choose Image > Reveal All. 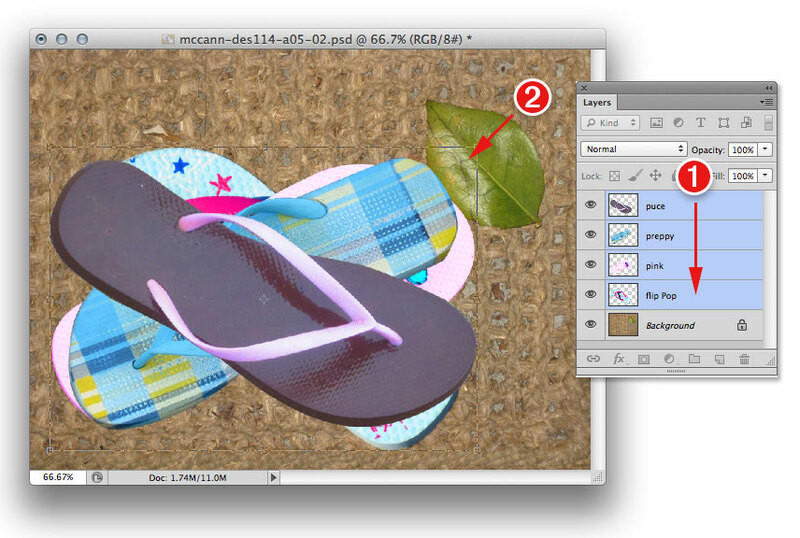 To remove pixels that are outside the canvas area from all layers, choose Select > All, then choose Image > Crop. This can help reduce the file size. If a layer contains pixels outside the canvas area and you merge it with the Background (not with another layer), the hidden pixels will be discarded. To shrink the contents of the current layer, choose the Move tool, check Show Transform Controls on the Options bar, Shift-drag a corner handle on the bounding box inward, then press Enter/Return. We’re dragging a layer from left to right to reveal hidden pixels. To shrink the edges of a selection, before you move, copy, or drag-copy it, click Refine Edge on the Options bar, then reduce the Shift Edge value. 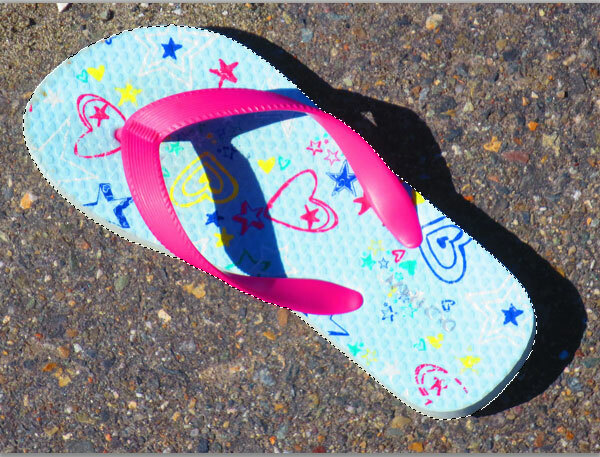 To soften the edges of the selection, use the Feather slider. Or even better, if you store a selection as a layer mask, you can use the nondestructive controls on the Properties panel at any time to change the Density and Feather values of the mask. 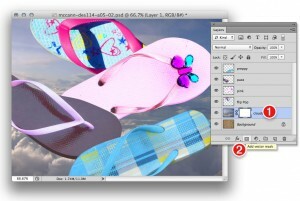 To copy layer seatings (e.9., blending mode, opacity, and layer effects) along with imagery when creating composite documents, instead of using the Clipboard, copy the whole layer. To copy imagery to a new layer within the same document without using the Clipboard, click a layer or the Background, create a selection, then press Ctrl-J/Cmd-J, or right-click in the image and choose Layer via Copy. Or if you want to remove the selected pixels from the original ;ayer and put them on a new layer. press Ctrl-Shift/Cmd-Shift-J, or right-click in the Image and choose Layer via Cut. 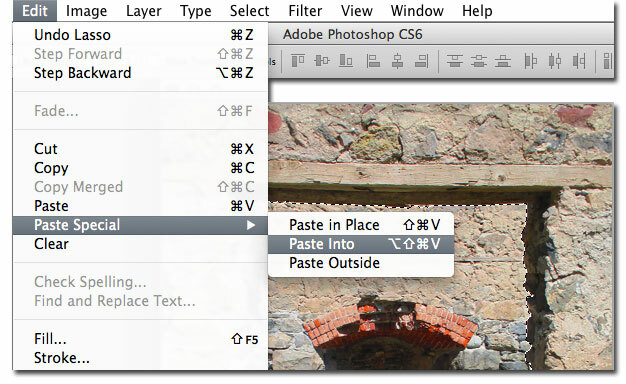 When you use the Paste Into command to paste the contents of the Clipboard into a selection, Photoshop creates a new layer and converts the selection to a layer mask. You can reposition the pasted imagery within the mask, edit the mask to reveal more or less of the imagery that it is hiding, or adjust the mask density or feather value via the Properties panel. 1. Select an area of a layer or the Background in a source image from which you want to copy pixels. 2. Choose Edit > Copy (Ctrl-C/Cmd-C) to copy pixels from only the currently selected layer, or choose Edit > Copy Merged (Ctrl-Shift-C/Cmd-Shift-C) to copy pixels within the selection area from all visible layers. 3. Click a layer in the same document or in another document. 4. Select the area (or areas) into which you want to paste the Clipboard contents. Optional: Click Refine Edge on the Options bar and use the dialog controls to refine the selection edge. 5. Choose Edit > Paste Special > Paste Into or press Ctrl-AIt-Shift-V/Cmd-Option-Shift-V. A new layer and layer mask appear. 6. Optional: Although the entire contents of the Clipboard were pasted, the layer mask may be hiding some of the imagery. To move the layer contents within the mask, hold down V (Move tool), click the layer thumbnail, then drag in the document. 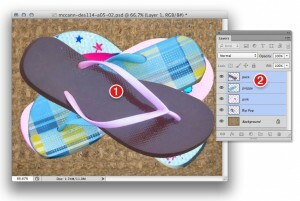 Or to move the layer mask, click the mask thumbnail before dragging. To move the layer and layer mask as a unit, click between the layer and mask thumbnails to produce a Link icon, then hold down V and drag in the image. 7. Optional: to reshape the mask, click the mask thumbnail. 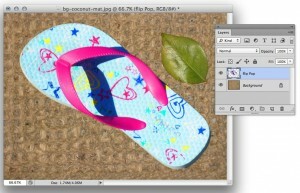 With the Brush tool, (B or Shift-B), a Soft Round brush, and white chosen as the Foreground color, paint in the document to expose more of the pasted image.To hide more of the pasted image, press X to paint with black. When you open the File > New dialog, it lists the dimensions of the smallest rectangle that can surround the current contents of the Clipboard, if any. Unlike the Cut and Copy commands, the Edit >Clear command empties a selection area without putting the selection contents onto the Clipboard. then chose the Copy command. Next, we used the Quick Selection tool to select the sky area in this document. 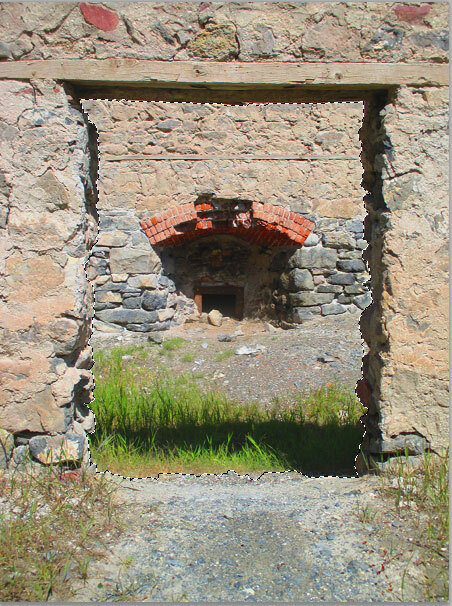 …for a Portal to the Cloud. 1. 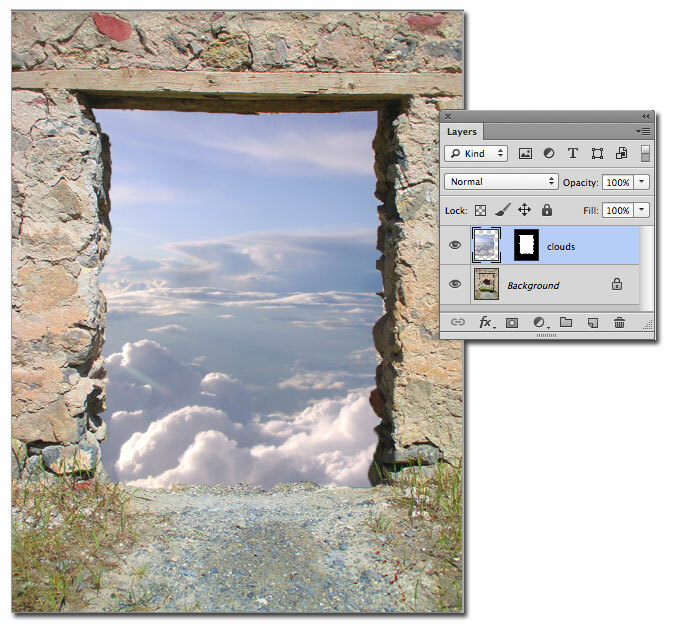 Select an area of a layer or the Background. Choose the Move tool L+ (V), then Alt-drag/ Option-drag the selection. The duplicate pixels will remain selected. With a tool other than the Move tool chosen, Ctrl-Alt-drag/Cmd-Opt ion-drag the selection. Include Shift with either shortcut listed above to constrain the movement to increments of 45′. With a selection active and a selection tool chosen, click Refine Edge on the Options bar (Ctrl-Alt-R/Cmd-Option-R). Choose View: On White (W), increase the Feather value, choose Output To: Selection, then click OK. The feathering will become evident visually when you move, drag-copy, copy and paste, or edit (e.9., apply brush strokes or filters to) the selection. When you drag and drop (drag-copy, for short) a selection of pixels from one document to another, presto, a duplicate of those pixels appears on a new layer in the target document. Pixels that land outside the canvas area can be moved into view at any time. An advantage of this method, as opposed to using the Clipboard, is that layer style settings (blending mode, opacity, and effects) in the layer that you drag and drop, along with any masks, are also copied. You can also drag-copy a shape, type, or Smart Object layer. 1. Open the source and target documents. Change the resolution in a copy of the source file, if needed. 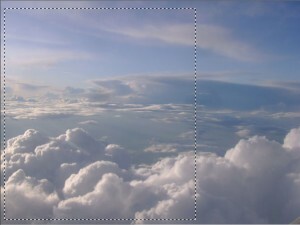 Suggested contents for the target file are a white or solid-color Background, a photo of a texture, or a screened-back image. 2. 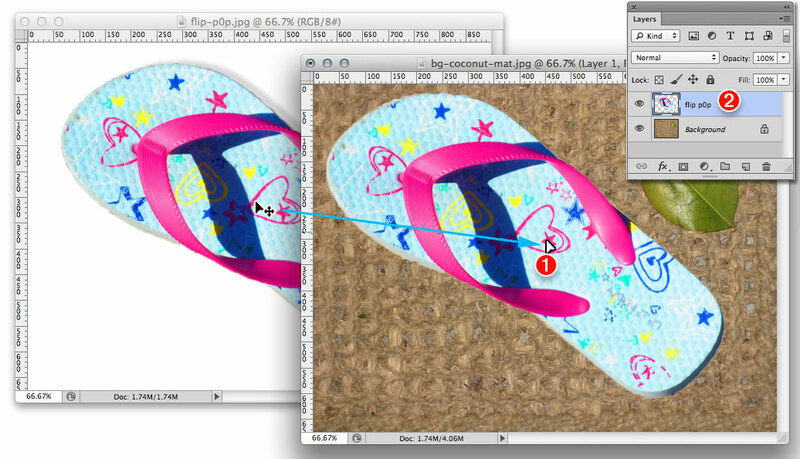 Click in the source document,then on the Layers panel, click a layer or the Background. Optional: Select part of the layer or Background. 3. Choose the Move tool (or hold down V). 4. Drag from inside the selection or layer in the source document window to the tab of the target document, pause until the target document displays, then release the mouse where you want the selection or layer to appear. To drop the copied selection or layer in the center of the source document, hold down Shift as you release the mouse. 5. If the source file has a different color profile than the target file, the Paste Profile Mismatch alert dialog will appear. We recommend that you click Convert (Preserve Color Appearance) to preserve the colors of the source image, then click OK.
An alert will also appear if the source and target files have a different bits-per-channel setting. Click Yes to accept the change in image quality (or click No to cancel). 6. 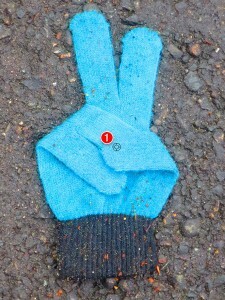 The duplicate content will appear on a new layer. You can reposition or scale it with the Move tool. 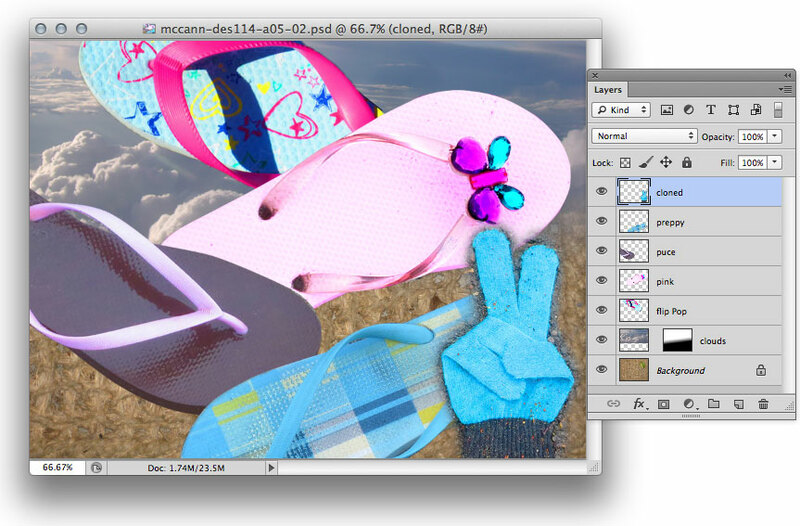 You can also drag and drop multiple selected layers. To copy a layer group, after step 3, above, check Auto-Select on the Options bar and choose Group on the menu, then continue with steps 4-6. We made a selection using the Quick Selection tool. Hint: Select the White area then use Select>Invert. Here we used the Move tool, clicked on the selection and dragged it from inside one window to the window of another document. The selection appears as a new layer in the target image. Make sure you name it! Here you will drag-copy one or more layers from the Layers panel of a source document into a target document. 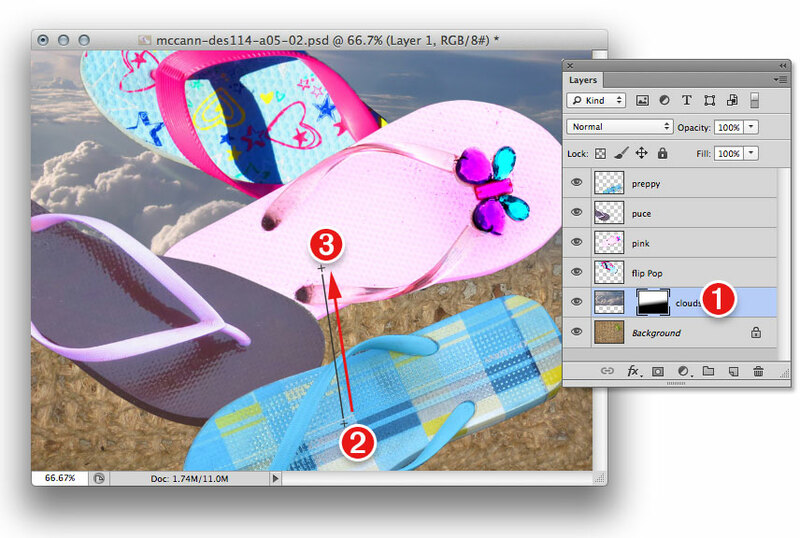 An advantage of this method is that you can control specifically which layers are copied. 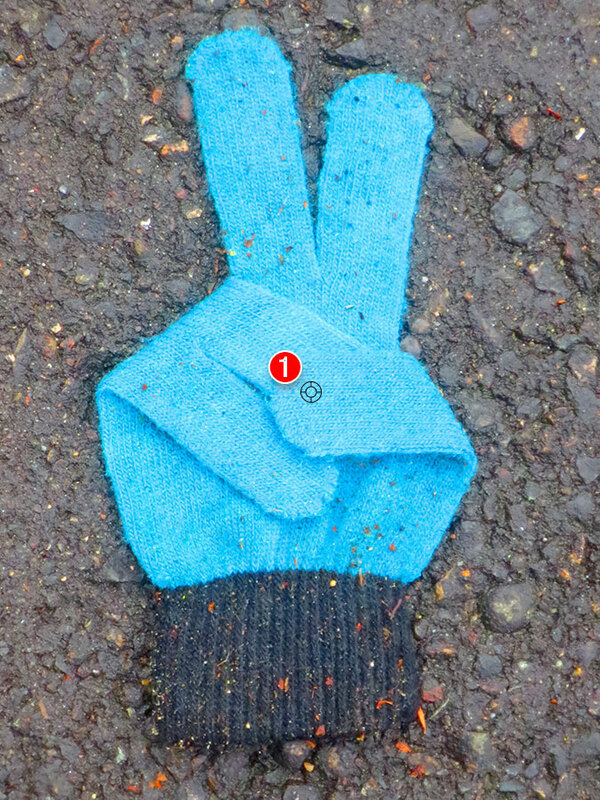 As with the Move tool method, any pixels that lie outside the live canvas area are also included. 1. Open the source and target documents. 2. Make selections in source documents and Copy/Paste or Drag/Drop into target document. 3. Click in the source document window, then on the Layers panel, click a layer, a layer group, or the Background, or Ctrl-click/Cmd-click multiple layers. 4. Drag from the Layers panel of the source document into the target document; hold down Shift while dragging to make the new imagery appear in the center of the target document (next page). The new layer (or layers) will be stacked above the previously selected one. 5. If the source document has a different color profile than the target document, the Paste Profile Mismatch alert dialog will appear. We recommend that you click Convert (Preserve Color Appearance) to preserve the appearance of colors in the source image, then click OK.
An alert will also appear if the source and target documents have different bits-per-channel settings. Click Yes to accept the change in image quality (or click No to cancel). 6. Either close the source document or right-click the tab for the target document and choose Consolidate All to Here from the context menu. 7. To scale a new layer, choose the Move tool and check Show Transform Controls on the Options bar. If you don’t see all the handles on the bounding box, press Ctrl-0/Cmd-0 for Fit on Screen view. Shift-drag a corner handle on the bounding box, then press Enter/Return to accept the new size. We dragged layers from other documents onto our target image (a photo of coconut fiber door mat), scaled and repositioned the new layers, and rotated a couple of them. To select a layer or group in the document window without using the Layers panel, hold down V (temporary Move tool), check Auto-Select on the Options bar, choose Group or Layer from the menu, then click a pixel area, type, or a shape in the document. To quickly create a new document from a layer, click the layer, then from the Layers panel menu, choose Duplicate Layer. The Duplicate Layer dialog opens. From the Document menu, choose New enter a name for the new document in the Name field, then click OK. Save the new file. Once you have gathered multiple layers into one document (regardless of the method used), you can soften the edges of any layer to make it look as if it’s blending into the underlying layers. Here this is done by applying a gradient to a layer mask. This technique works equally well for image, type, and shape layers. 1. Gather several layers into a target document by following the steps previously. Position and scale the layers with the Move tool as necessary. 2. On the Layers panel click one of the layers, then click the Add Layer Mask button. Keep the mask thumbnail selected. 3. Choose the Gradient tool (G or Shift-G). 4. On the Options bar, do the following; Click the Gradient picker arrowhead on the Options bar, then click the “Black,White” gradient. Note: If you don’t see this preset, choose Reset Gradients from the picker menu, then click OK in the alert dialog. “Black,White” is the third gradient in the default library. Click the Linear Gradient button. Choose Mode: Normal and an Opacity of 100%. In the image, start dragging horizontally or diagonally from where you want the complete fadeout to be, and stop dragging where you want the layer to be fully visible. Hold down Shift while dragging to constrain the angle to an increment of 45′. The gradient will appear in the layer mask, and the content of that layer will be partially hidden. To redo the mask effect, click the layer mask thumbnail, then with the Gradient tool at 100% Opacity, drag in the document again in a new direction or from a different starting point. We added a mask to the “cloud‘ layer, chose the Gradient tool and the “Black, White” preset, then dragged up and slightly to the left, as shown by the arrow. The gradient in the mask is hiding the bottom half of the “cloud” layer. By applying strokes with the Clone Stamp tool, you can clone all or part of an image from one layer to another in the same document or between documents. This tool is useful for creative montaging, commercial retouching, and video editing. Using the Clone Source panel, you can assign and keep track of up to five different source documents (represented by a row of buttons at the top of the panel), as well as transform the source pixels before or as you clone them. 1. Open one or more RGB documents to be used as source imagery, and create or open a target document. 2. Choose the Clone Stamp tool (S or Shift-S). On the Options bar, choose a Soft Round brush, a Mode, an Opacity percentage, and a Flow percentage, and check Aligned. Optional: If you have a stylus and tablet, you can activate the Pressure for Opacity button and/or the Pressure for Size button on the Options bar. Optional: If the source file contains any adjustment layers and you want the Clone Stamp tool to ignore their effects when sampling, activate the Ignore Adjustment Layers When Cloning button. 4. Show the Clone Source panel. By default, the first source button is selected. Check Show Overlay and Auto Hide, then set the Opacity to around 35-50% so you’ll be able to preview the source image as an overlay (a faint version of the source layer). If you want the overlay to display only within the brush cursor instead of across the whole document, check Clipped. 4. In the target document, create a new, blank layer. 5. Click the source document tab. From the Sample menu on the Options bar, choose the part of the document from which you want to clone: Current Layer, Current & Below, or All Layers. For either of the first two options, also click a layer. 6. Alt-click/Option-click an area in the image to set the source point. The source file and layer will be assigned to, and will be listed below, the first source button on the Clone Source panel. 7. Click the target document tab. Beware! The Clone Source panel keeps the links active only while the source documents are open. If you close a source document, its link to the Clone Source panel is broken. We warned you. 9. To clone from another open document, click the second source button at the top of the Clone Source panel, then repeat steps 4-8. At any time, you can switch between clone sources by clicking a different button. Using the Clone Source panel, you can switch between multiple sources, transform the clone overlay, and choose display options. With the Clone Stamp tool, we held down Alt/Option and clicked in a source document. When using the Clone Stamp tool, the position and orientation values of the source overlay stick unless you change them. Between strokes with the tool, you can reposition, scale, flip, or rotate the overlay via the Clone Source panel or via keyboard shortcuts. New settings will apply only to the currently selected clone source. To reposition the source overlay, uncheck Clipped, then change the Offset X and/or Y values on the panel or Alt-Shift-drag/Option-Shift-drag in the image. To scale the source overlay, hold down Alt-Shift/Option-Shift and press (and keep pressing) [ or ]. Or to scale the overlay via the panel, activate the Maintain Aspect Ratio button to preserve the aspect ratio of the source imagery, then change the W or H value. To preserve the image quality, avoid scaling the source more than 120% or -120%. To flip the source, click the Flip Horizontal and/or Flip Vertical button. To rotate the overlay, change the Rotate value, or hold down Alt-Shift/Option-Shift and press (and keep pressing) < or >. To restore the default flip, scale, and rotation values to the current clone source, click the Reset Transform button. To show the Clone Source panel when the Clone Stamp tool is selected, you can click the Toggle Clone Source panel button on the Options bar. Before we began cloning the bottle, we clicked the Link icon on the Clone Source panel and changed the W/H values to 50%. Then we started dragging with the Clone Stomp tool on a new, blank layer (properly named) in our target document to “brush in” part of a bottle image layer from the source document. We used the Move tool reposition the new “clone” layer.